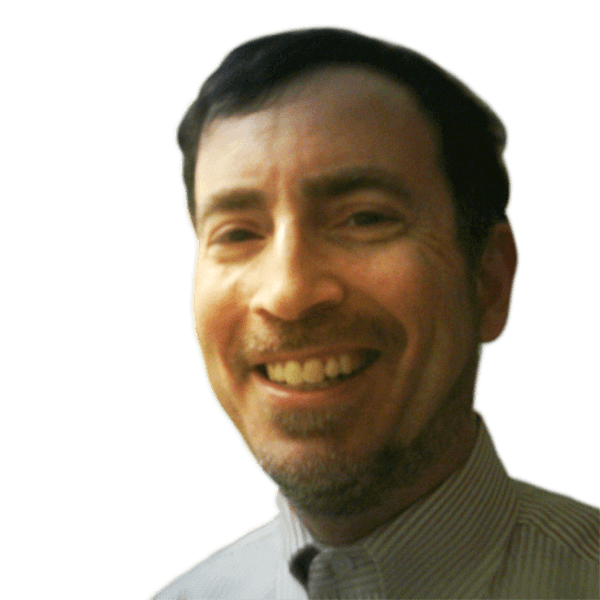 Subversion doesn't have to be difficult, especially if you have Michael Sorens's guide at hand. After dealing in previous articles with checkouts and commits in Subversion, and covering the various file-manipulation operations that are required for Subversion, Michael now deals in this article with file macro-management, the operations such as putting things in, and taking things out, that deal with repositories and projects. Part 1: Checkouts and commits in a multiple-user environment. Part 2: Adding, deleting, moving, and renaming files, plus filtering what you add. In the previous installment in this series, we focused on the minutiae of file management: adding, deleting, renaming, moving files and folders, with major emphasis on fine-tuning additions. This part now turns to file macro-management. Akin to the economic analogy of macro-economics dealing with forces that drive the economy as a whole, recipes in this part consider repositories and projects. Reminder: Refer to the Subversion book and the TortoiseSVN book for further reading as needed, and as directed in the recipes below. Your working copy is what you have checked out from the repository onto your local machine, regardless of whether this is the whole tree or a single folder, on the trunk or on a branch. Also see What is a working copy on StackOverflow to really get a grasp on this, if you haven’t already. Furthermore, at the time of writing release 1.7 of Subversion (and the corresponding TortoiseSVN 1.7) is still fresh, barely a couple weeks in the wild. So starting with this part 3 article, I point out some notable improvements with this new release, where applicable. You rarely need to set up a repository: Even when one is required, your system administrator is likely to want to do it. However, I am sure you will agree it is a crucial step so it would be remiss of me to omit a reference to this topic, however brief. Creating a repository is as simple as invoking the TortoiseSVN >> Create Repository here command (see Repository Creation in the TortoiseSVN book). It immediately starts to get a bit more involved though: your next step is to decide on your repository layout, i.e.do you want trunk, branches, and tags to be the absolute top-level in the repository, or do you want to subsume them within each project (see Repository Layout in the TortoiseSVN book). You must create the structure yourself. With version 1.7, TortoiseSVN will now add your trunk, branches, and tags directory structure for you, if you so wish. Select Create folder structure (see Figure 3-1) and the three standard folders are generated automatically, saving you several steps. Figure 3-1 TortoiseSVN 1.7 now provides one-click convenience to setup the canonical folder hierarchy at the top of your repository. In the early days of Subversion, setting up a server required a good understanding of server configuration and in previous versions of this manual we included detailed descriptions of how to set up a server. Since then things have become easier as there are now several pre-packaged server installers available which guide you through the setup and configuration process. Whether you want to start a whole project tree entirely, or just add a subtree to an existing project, the steps are essentially the same. In the case of a new project, you have to be familiar with the repository layout, though: unless your system administrator has set them up you will need to create the top-level trunk, branches, and tags folders for the new project before proceeding with this recipe. See the Setting up a new repository recipe for more. There are two ways to import a file tree into the repository: the one-step import and the import-in-place techniques. The table shows that the latter is generally more advantageous-for each row, the item marked in green is better. Remove all files which you do not want to import (operate on a copy of the directory if you do not want to lose those!). This import technique isn’t versatile enough to be selective; it will include all objects in the tree (item 2 in the table). Invoke TortoiseSVN >> Import to import into the repository. Item 4 is relevant here: it is easy to lose your subtree root because the root itself is not imported; you must include that in the target URL. Use SVN Checkout (if a new project) or SVN Update (if part of an existing project) to update your working copy to include the newly imported files. Create a new folder in the repo-browser matching the name of the root folder of your subtree to import. Use SVN Checkout to checkout the new, empty folder right on top of your existing folder. TortoiseSVN will warn you that the folder is not empty, but you knew that already. Finally, invoke SVN Add on the newly versioned folder. The Add dialog lists all the unversioned objects, allowing you to select or deselect what you wish. Commit everything you have added. See Importing Data Into A Repository in the TortoiseSVN book for more detail. Notice that the folder browser opens at the top of your file system tree so it may take you quite a few clicks to drill down to your destination folder. Alternately you can use drag-and-drop convenience instead of the Export command and the only thing you need give up is the choice to omit externals. To do this, open Windows Explorer or equivalent so that you have access to your source location and your destination location at the same time so you will be able to drag from the source to the destination. 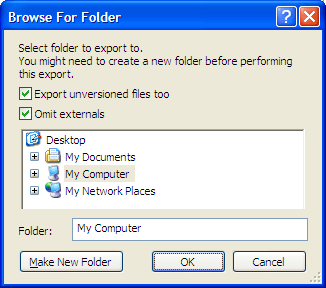 Typically you could do this by enabling the folders pane and expanding the folder structure to expose your destination while setting the files pane to show your source. Alternately, you could use two separate Explorer windows, one for source and one for destination. Select one or more folders from your source and drag them over the target by depressing the right-mouse button rather than the left. Upon releasing the mouse button, besides the standard copy, move, and shortcut buttons, the context menu will include two Subversion commands for exporting, as shown in Figure 3-3. Figure 3-3 The context menu resulting from a drag-and-drop operation. Those two choices are the equivalent of selecting or unselecting the Export unversioned items too checkbox above. The metadata storage within your working copy was substantially revised in version 1.7-there is but a single .svn directory in your root checkout folder. Thus it is a trivial task to copy the working copy to an unversioned tree: You just need to copy the tree through conventional means (Windows Explorer) and then delete that one .svn folder from the copy. A working copy in TortoiseSVN 1.6 is a subtree that is peppered with .svn files allowing TortoiseSVN to keep track of your interaction with the repository. If you want to strip out all these Subversion artifacts use the TortoiseSVN >> Export command, exporting the target folder to itself. 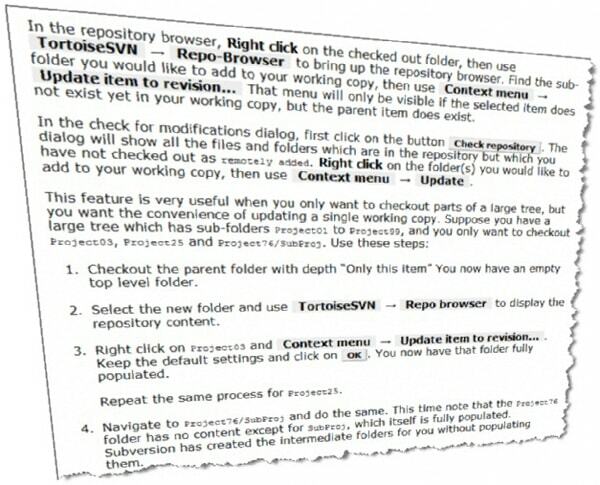 TortoiseSVN will recognize what you are doing and prompt to ensure that you want to make the working copy unversioned. A slightly better way requires installing a simple shell command with a registry tweak to actually give you a Delete SVN choice on the context menu. This saves the completely redundant step with the export command of having to navigate to the folder you already started from. See Jon Galloway’s Remove SVN Folders hook. The metadata storage within your working copy was substantially revised in version 1.7-there is but a single .svn directory in your root checkout folder. Thus it is trivial to convert the working copy to an unversioned tree by simply deleting that one .svn folder. There are two easy ways to unversion a file, i.e. to delete it from the repository but to keep your local copy. The first method does only that; the second method has a side effect of modifying your ignore list. Whichever leaf action you choose, the specific file you started with is marked for deletion from the repository. Once you commit the deletion, the file will remain in place, but now be unversioned. The side effect of this command is that it updates the svn-ignore list of the parent directory, with either the specific file name, or the file’s extension. Once this change is committed, the now-unversioned file will be ignored by TortoiseSVN, showing no icon overlay. Note that the svn-ignore list applies only to unversioned files; thus, if you selected to ignore by extension and you have other versioned files in the same directory with the same extension, they will be unaffected by the ignore directive. Any new files you create with the extension will be ignored by TortoiseSVN. This recipe is essentially the same as the last, except for the first step. Instead of just opening Explorer, do a search in explorer to find all the files of interest. Select all ‘found’ files (Control-A) then proceed as above. Here, the TortoiseSVN leaf choice will say “Delete and ignore n items by name” and “Delete and ignore n items by extension”. Upon selecting it, all n files will be marked for deletion and the parent directory of each will have an entry added to its svn-ignore list. Thanks to this StackOverflow question for inspiration for this recipe. Just delete the file tree from your disk with Windows Explorer or equivalent. To easily select only the items you want for the checkout and force the resulting working copy to keep only those items, click the Choose items… button. This opens a new dialog where you can check all items you want in your working copy and uncheck all the items you don’t want. The Choose items… button is not particularly prominent, being in about the middle of the Checkout dialog. But what it lacks in prominence in makes up for in power! It opens a secondary dialog containing your file tree arranged hierarchically, with every file and folder having an adjacent checkbox to enable or disable it. Note that deselecting a folder will also deselect everything below it hierarchically, while selecting a folder selects just that individual folder. This makes it easy to prune subtrees out. But be careful! If you accidentally deselect some parent folder, this can wipe out a whole slew of choices you may have set up below that. As discussed in the introduction to Part 1, version control is just as useful for a single-user environment as it is for a large team. Setting up a Subversion or TortoiseSVN installation for a single-user environment, though, can be done more simply than a multi-user environment. For example, you do not actually need to set up a server for your Subversion repository; you could just use the file:// protocol to access the repository on your local machine and you do not have to set up a server. See either TortoiseSVN for the single user or, for command-line use, Single-User Subversion. Both of those articles are quite ancient in Internet time but the basics they cover are still valid. Please note, however, that the non-server implementation approach, while possible, is not necessarily the best choice because you get no security with the file:// protocol and you have uncontrolled access to the Subversion database (allowing avenues for corruption). For small installations-including single user-consider running the svnserve server included with the Subversion distribution. And, as of TortoiseSVN 1.7, now included with TortoiseSVN as well! Svnserve is a lightweight, standalone Subversion server designed for situations where you do not need the full might of an Apache server. Also see the thorough discussion on the finer points of the svnserve server by David W. in his answer to this StackOverflow post. If you want to connect to a new repository, i.e. a different one than one you have previously been working in, simply do a clean checkout from the new repository. Full stop. If you want to switch to a different branch or directory within your current repository tree, use the TortoiseSVN >> Switch command. Full stop. If you want to relocate your working copy, either do a clean checkout to a new local file location or move your existing subtree with Windows Explorer. Full stop. You should only be continuing to read this recipe if the address to your repository has changed, whether it is the IP address, the protocol (e.g. http vs. https); or the root path. In such cases, you want to redirect your existing working copy to point to the new location of the repository on the server. Use the TortoiseSVN >> Relocate command to do this. All you have to specify is the new URL. See Relocating a working copy in the TortoiseSVN book. This is what I have been searching in quite a few web pages and I ultimately identified it right here. Wonderful post. I am so impressed.